Our goal at Atkins is for each patient to transition safely back home and into everyday life at his or her prior level of function. We work to accomplish this goal by providing rehabilitation services custom to each individual patient and their families. The rehabilitation services offered at Atkins are designed around the individual needs and comfort level of the patient. We work to keep a clear line of communication between patient and family to reduce the amount of stress that often accompanies an injury, illness, or surgery requiring rehabilitative therapies. Our team provides first class therapy to patients in the process of rehabilitation. 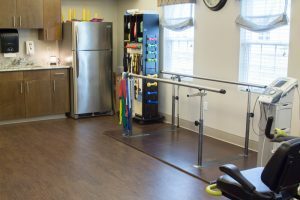 What types of rehabilitation therapy do we offer? Atkins is home to a passionate therapy team devoted to bringing the latest advances to our patients. Working closely with the patient’s personal physician, we cover all aspects of rehabilitative care. Physical therapy – To rebuild strength and balance. Occupational therapy – To improve management of everyday tasks. Speech/language therapy – To develop speech and swallowing abilities.